So as you might have realised now I’m a little obsessed with Soap and Glory? Not like really obsessed just a little I have quite a few of their products due to the fact that each Christmas I get some sort of Soap and Glory gift box. These products that I get at Christmas time usually last me quite a long time because Soap and Glory are quite generous with their products. Soap and Glory have a huge range from body cream to eyeliner their whole range is pretty reasonable and of high quality. 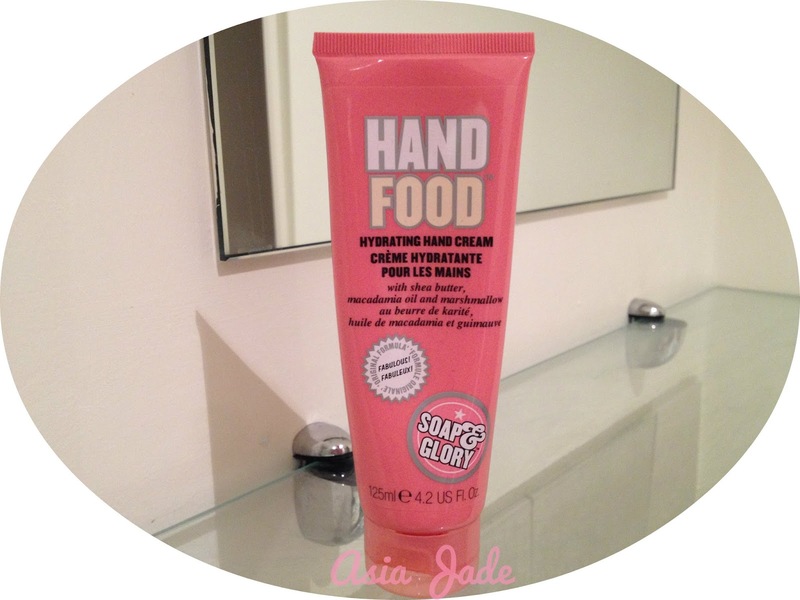 I’ve always been fascinated by Soap and Glory because they portray a glamorous brand which has always intrigued me. Seeing lots of reviews from various Soap and Glory products made me want a product from them even more. So when I did get my first product I felt like a princess who’s been handed a beautiful crown except it was a gorgeous smelling body lotion that I absolutely loved!! So this hand cream cream smells beautiful it has Shea Butter, Macadamia Oil and Marshmallow within it. I love this hand cream because you only have to use a small amount which drys quickly which is always good when it comes to hand cream. It leaves your hands feeling super smooth and smelling amazing. I would love to purchase the smaller version so that I can pop it in my bag because taking this one around with me takes up a bit of room. This is a great go to hand cream when your hands are dry because it moisturises them straight away and lasts quite a long time. I recommend it because it’s reasonable and lasts me a long time it’s great to share with your friends and is an all time favourite. This over night soak-in foot mask is a great way to hydrate your heels after a night out or just when you feel like pampering your feet. All you have to do is apply generously then put some socks on and leave them on over night. I have to admit the first time that I did this it felt incredibly weird because I don’t normally sleep with my socks on. However in the morning when I removed my socks my feet were the softest I have ever felt them I felt so happy. I now apply this foot mask once a week or more if they need it and just pamper my feet. Because you do need to look after your feet to keep them looking gorgeous. I’ve even recommended it to a few of my friends as we like to share our favourite products of the month with each other and now I’m sharing it with you guys. "Review | Nivea Body In-Shower Moisturiser"
"Review | Kate Moss Rimmel Shade 5"